Our range of Hairdressing Scissors includes many different types of scissors: straight scissors, thinning scissors, curved blade scissors etc. How to choose my Hairdressing Scissors? If you're looking for professional hairdressing scissors, then you must know exactly what you will use them for. Straight scissors are the most commonly used for haircutting, with thinning scissors used for reduction in volume, not length. With many premium brands such as Joewell, Dovo and Roseline with scissors made from the finest Japanese steel, perfection is within your grasp. Need help deciding which hairdressing scissors to buy? Check out our guide to hairdressing scissors. Already bought the perfect scissors for you? Find out how to take the best care of your scissors for a longer product life! Our "Diamond Edge” brand has always been a guarantee of fine quality and our scissors fully maintain this standard. We offer a lifetime guarantee on all our "Diamond Edge” brand scissors against manufacturing defects (subject to and limited by the exceptions of normal wear and tear and any damage caused through accidental damage). The Fisher name is renowned for quality and value. The Pro-Cut Turbo and Roseline ranges fully maintain this reputation.Click here to see our current range. 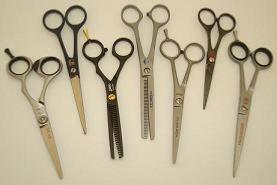 Ama and Gotta are among the longest-established and most respected names in the field of hairdressing scissors. Click here to see the full range of models and sizes we carry. Japanese scissors are widely recognised by the professional hairdresser as the finest high performance scissors and Jowell have managed to help carry that reputation. Click here to see the range of Jowell brand Japanese scissors which we offer. Other popular, tried and tested Japanese scissors that also carry the familiar and trustworthy performance you get with Japanese tempered steel. Click here to see our current range. Jaguar have established an enviable reputation for high quality and innovative designs. They offer a range of scissors to suit all budgets.Click here to see our current range. The Dovo range offers a top quality choice of scissors at attractive prices.Click here to view the current range we offer. The Timor range continues to offer top quality at an attractive price.Click here to view the current range we carry. Great value scissors in a range of styles and sizes. 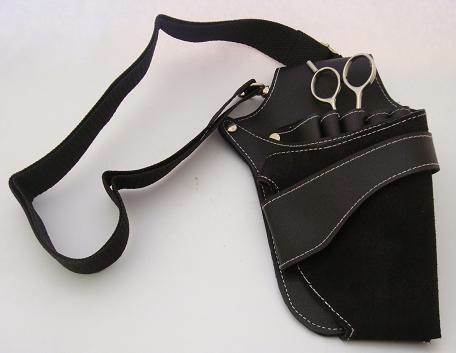 Scissor holsters and pouches to safely store and protect your hairdressing scissors, in a range of different patterns and colours.